Wooden board construction with shiny printed laminated design. Large mirror on inside lid and pull out upper tray. Clockwork wound from the back, open the lid & the elf figurine revolves as music plays. 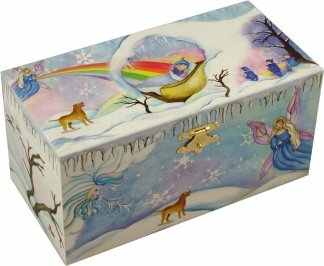 This enchanting musical treasure box has a wonderful winter scene where the winter fairies are watching over the little elves. Open the music box to reveal the velvet lined interior with a lift out tray to store plenty of jewels & treasures. 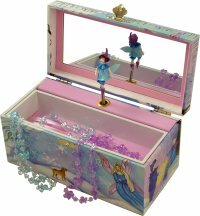 On the inside lid is a large mirror and as the music plays the little elf revolves. A perfect box for Christmas !